Hires Big H remains Utah burger royalty. There's a pretty good chance that one of the first burgers I ever tried—not made by my mom, that is—came from Hires Big H (425 S. 700 East, 801-364-4582). Along with a few other downtown eateries that don't exist anymore, Hires was one of my parents' go-to stops whenever we visited the big city from our suburban West Jordan refuge. It's been a place I've revisited at different phases in my life, and even after my most recent excursion, the quality and charm of this steadfast eatery has remained pleasantly unchanged. The deliberate attention to crafting burgers in their own particular way—a quarter pound of ground chuck, veggies, fry sauce and a housemade bun to boot—is undoubtedly the secret to the Big H's longevity. It's been around since 1959, so its golden-age carhop vibe isn't just a gimmick. In those nearly 60 years, Hires has opened locations in Midvale and West Valley, in addition to its Salt Lake digs. The nostalgia factor combined with a burger that liberally incorporates fry sauce, the region's condiment of choice, makes Hires a Utah food-scene pillar. Although I've visited Hires many times, it seems like ages since I last dropped in. In the interim, I've consumed many burgers from many places, and I was curious to see how present-day Alex would respond to a place where I'd eaten religiously since before I could tie my own shoes. Admittedly, I was a little worried it wouldn't stack up—I mean, I loved The Last Starfighter as a kid, but I sure as hell don't like it as an adult. After a few bites into the namesake Big H ($5.55), it became clear Hires still knows what it's doing. 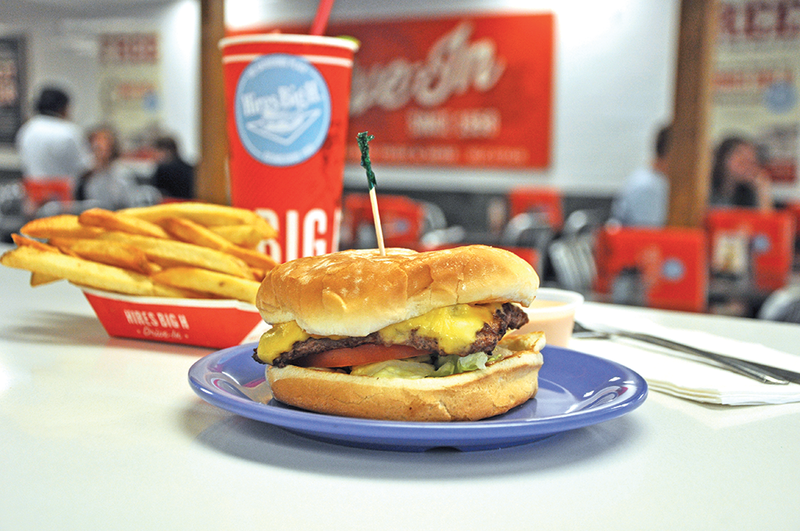 It's hard to pin down just what makes the Big H a Zagat-recognized, nationally ranked burger. The beef and fresh veggies are crucial—they pack the right balance of salty juiciness and complementary crispness—but I think it's the flour-topped bun and healthy dollop of fry sauce that push it toward mythical ethos. The restaurant bakes its own buns in-house, which enhances the fresh-forward flavor, and the tangy fry sauce is a perfect condiment for just about any burger. Here, they brew their sauce a bit more ketchup-heavy than other places, which makes for a sweeter contrast to the menu's more savory elements. Once you've enjoyed the Big H firsthand, it only makes sense to dabble in some of the restaurant's more tricked-out versions. The menu's Specialty H section is where Hires serves up some signature classics with a unique spin. For example, the Roquefort bacon H ($6.55) adds blue cheese dressing, bacon and pickles to the foundational Big H for a steakhouse riff on the classic, and the pastrami H ($6.55) is a worthy interpretation of the pastrami burger that's become a fixture in Utah's fast-food scene. You are welcome to create your own piece of burger history with a list of garnishes that includes everything from jalapeños and fresh avocado to grilled mushrooms and—the most contested of all toppings—pineapple. Go wild. The haunt's side game is also strong, as its fries are good enough to hold their own against the menu's bolder flavors. But its onion rings win the Oscar for best supporting actor. They don't skimp on thickness and are topped with a delightfully crunchy, panko-like coating. Sure, they're fantastic on their own, but any of Hires' signature dipping sauces can do wonders for these rings of fried, greasy gold. As with any burger joint worth its salt, Hires also offers a selection of tasty shakes and other desserts. If you're looking for a true Hires experience, I suggest opting for a root beer float ($4.55). Hires takes its name from the brand of root beer that founder Don Hale started selling in the restaurant's infancy, and they still craft their own stuff today. The Hires root beer loses something in a takeout cup full of ice, but if you order that sucker loaded with vanilla ice cream served in a frosty mug, you're in for a turbo-charged dose of nostalgia. I was in the mood for a milkshake during my most recent visit, and thanks to a factoid about how Hale's favorite meal included a pineapple malt ($5.05), that's what I went for. I can safely say I've never had a pineapple malt before, and I found it's just right for a balmy summer evening—cool, creamy and with just enough tropical flavor to keep your tastebuds on their toes. The bottom line? Any restaurant that can flourish for nearly a lifetime is worth checking out. Sure, a fair share of similar joints abound, but Hires is more than just another place to order a burger. It's part of a handful of restaurants that gritted its teeth and held on while a goon squad of national chains tried to force them out of their neighborhoods. Rather than buckle under the pressure of billions and billions served, Hires kept making things its way and managed to become a legendary chapter in Utah's culinary history. Come for the burgers; stay to give the finger to the swollen franchises that tried—and failed—to beat Hires at its own game.